The FIA International Court of Appeal has now released its findings in the double diffuser appeal and it has to be said that it is a model of rational legal thinking. To put it in a nutshell, it cuts through the crap. Considering how far the protesting teams went in their efforts to manufacture a reason to ban the double diffuser, the court has done exceptionally well in dismissing their various points. In particular, there is one decision that has important implications for the future: the response to the Sixth Plea, that The Decision of the Stewards is Inconsistent with Previous Statements Rendered by the FIA. The court's view is interesting enough to be considered in full. 85. The Court observes that opinions of the Technical Department, while performing a vital role, are advisory in nature and are not Technical Regulations. Teams are obliged to comply with the TR as written. It is for the Stewards, and ultimately this Court, to offer binding interpretations of the TR. Even if the Contested Decisions were inconsistent with any opinion of the FIA Technical Department (which has not been established), this would not give rise to the invalidity of the Contested Decisions. The Court therefore denies the Sixth Plea. This clarifies the relationship between the FIA's Technical Department and the stewards, together with the ICA itself. Only the court and the stewards can rule on the legality of tweaks to the cars and the FIA's opinion is just that - an opinion. Asking the FIA about something you want to design into your car is therefore a bit like asking a lawyer for guidance; he can give you an idea of the likelihood of winning your case but there are no guarantees. Suddenly it appears pointless for the teams to ask the FIA for advice on the legality of any development to their designs. Every F1 engineer has to study the regulations in great detail and so his opinion on the boundaries of legality is likely to be much closer to the truth than anything the FIA might think. What matters is the opinion of the stewards and the ICA and neither Max Mosley nor Charlie Whiting can give a guarantee on legality. That is how it should be. In democratic government the laws are made by one body but it is another that interprets them and, apparently, this is exactly what happens within F1 too. Our only quibble should be that the system leads to nothing being decided before the season begins and subsequent long waits while the court is convened to decide upon any contentious matters. This is obviously unfair to the teams trying to work within the rules and has the potential for unnecessary expense in the losers having to spend extra money on changing their cars to suit the ruling. The double diffuser saga has made it clear that there needs to be a mechanism for the court to be convened during the off season to give a ruling on such issues. After all, we have been talking about double diffusers for months and the matter could have been sorted out before the season started. But, as Bill Shakespeare once said, "All's well that ends well." The double diffuser issue is decided and now all the teams will have to fit them if they want to stay in the hunt for the championship. BMW has yet to withdraw its protest and, theoretically, could force another hearing but the decision would be the same. Dr Theissen seems to have accepted that he must adjust the F1.09 to take a double diffuser but reckons that it may not be ready for the Barcelona GP. That is a welcome return to good sense for the BMW motorsport boss and I am happy to hear that the team will not resort to panic measures such as an abandonment of the season for development of the car for 2010. 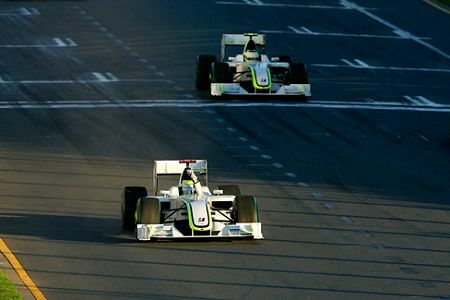 Brawn GP may have an impressive lead in the championship after three races but the other teams can claw back that advantage now that they know what is allowed. Early leads are pleasant to have but are no guarantee of ultimate success. In 1979, Ligier established a lead with a few wins at the beginning of the season but faded away to allow Ferrari to take the spoils at the end. There is no reason why one of the teams this year could not take the idea of a double diffuser and make it work better than Brawn's or anyone else's; in 1979 again, Williams embraced Chapman's ground effect principles and produced the FW07, the car to beat for at least two years afterwards. It may not be the best-funded teams that use the double diffuser to best effect; without testing, much depends on luck as well as computer simulations and wind tunnels. What will matter most is speed of development and McLaren and Renault seem to have that well in hand. Ferrari too are expecting to have important developments by Barcelona, others in time for the Monaco GP. It has potential to be a fascinating season, with designers racing in their offices while the drivers fight it out on the track. This is what F1 is really all about, competition to the utmost throughout the season. Who needs a spec series? "Only the court and the stewards can rule on the legality of tweaks to the cars and the FIA's opinion is just that - an opinion. Asking the FIA about something you want to design into your car is therefore a bit like asking a lawyer for guidance; he can give you an idea of the likelihood of winning your case but there are no guarantees." "[…] it is however necessary, for any future developments that might apply to similar devices, to refer to Article 2.4 of the Technical Regulations which allows competitors to justify the innovations"
I realize the quotations here are dizzying but Renault does have a point, and I think the ICA gives little guidance to the teams' future actions (therefore no clarification) by arguing that the Tuned Mass Damper had not been seen before but diffusers have. As you pointed out, Teams may ask the FIA for their opinion, but it won't be binding. Or they may proceed without an FIA nod, and be dinged for not seeking FIA approval. This means these issues will only ever be clarified in the ICA. You are right in recognizing that the current system needs a way to convene the ICA during the off season. The only other solution would be to redesign the entire system of rule clarification and/or stewarding. I have to say that this ruling worries me a little. Teams will never know if their car is legal until it has been contested by either the stewards or another team at which point it will be too late to do anything (especially with the budget caps). The FIA should be able to say if a car is legal well before the season starts if asked by any of the teams. There should be a fast track to getting clarification on rules so that teams can get a response before the racing even begins. It also shows that the rules should be simpler and less obtrusive so that there is scope to be inventive without even nearing illegality. The comparison with democratic society is an interesting one as in a democratic society laws are created intentionally to be relatively grey in order to ensure that they are effectively moulded by the society in general as society is an inherently complex beast and one rule can not suit all cases. However sporting rules need to be as simple and as black and white as possible in order that the competitors and fans are both aware of what is happening. I know that Motor racing is always going to have more complicated rules that tennis for instance as it is naturally a complex sport in terms of technology and safety but I think ultimately the governing body should be able to give definitive decisions. You do not get referees telling fifa how to interpret their rules! It also brings into question the point of Whiting clarifying rules with drivers before the race as it is clearly stated that his advice is practically worthelss. Who do the teams now approach to clarify things before and during a race? Marc: I agree that the court left the matter of seeking clarification somewhat open. Their opinion seems to be that it's a good thing to seek such assurance but not absolutely necessary (which Renault wanted them to say). The method of avoiding the precedent of the mass damper (mass dampers new, diffusers seen before) was a little dubious but leads to the conclusion that only new ideas have to be clarified by the FIA technical staff. That will lead to arguments in the future as to whether something is new or an adaptation of a previously seen tweak, which should keep the court busy. I do not see how the court could have insisted upon prior clarification, however. That would effectively be handing some of their power to make definitive decisions to the FIA Technical Department - and they have made it clear that is not what they want. It is a grey area that the teams are just going to have to live with, therefore. Lee: Before the season began, Max said at one point that, had there been more time, he would have convened the ICA to give a ruling on double diffusers. The time point is specious, since both Renault and Red Bull queried the diffuser a couple of months before the first race of the season but it does show that the court can be convened to rule on new issues during the off season. It seems to me that, had Max been less eager to spout his irrelevant opinion on the matter and instead convened the court straight away, it could have been dealt with in a much more efficient manner. If the Technical Department's opinion is not definitive, it might be better to do away with clarifications from them entirely and substitute a standing commission from the ICA whose job it would be to give rulings on the fast track. That is not going to happen, of course, because the legal profession will insist on plenty of time to get their arguments in order. The alternative is to let the Technical Department give rulings and take away the option to appeal. That would be a much quicker system but is open to abuse, especially when the Chief Technical Officer's impartiality is dubious. Overall, I think the present system is about as good as F1 is going to get. The matter of race control during a race is another area that bears inspection. A system of priority of incidents should be established so that Race Control cannot refuse to look at an incident that affects the finishing order because they are looking at videos of an accident that has already happened and has no bearing on results. TV shots of Race Control reveal that there are at least a dozen people involved in overseeing the race and there is no reason why teams of a few people should not be set up to deal with cases of multiple incidents. I agree that race control should be able to make deffinitive decisions quickly and during a race and that this would almost put an end to the post race farce. However if it takes a team of lawyers and and court to decide on whether someone has broken the rules or not then it would seem a few people in race control would be unable or at least unwilling to make those decisions during a race. The rules are the problem, they have become far too complex and inconsistent decisions have proved this (ie Hamilton punished for leaving the circuit in the same race that many other cars also left the circuit). The rules should be written in a way that they are either broken or not broken. Also unless a team or driver is clearly cheating, any rules innocently broken should not be punished after the race (although it should be possible to simply fine drivers after the fact but not change the results). Lee: Agreed completely, especially that the regulations need to be clearer. It is a common legal problem that, in attempting to be very specific in limits of the rule, the language becomes so convoluted that loopholes appear everywhere.